As temperatures shift from frigid to mild, warming of grain at the outside edges of bins will trigger new movement of moisture throughout the grain. This could increase the spoilage risk for grain stored tough. 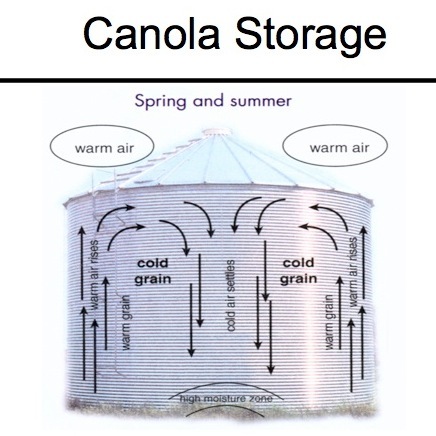 Keep watch on canola bins once these temperature reversals begin throughout the spring. As outside air warms up, moisture migration cycles in the bin can concentrate warm moist air, creating a potential start point for spoilage. Check bins. Read more on results from a study on how to handle bins of canola that won’t be unloaded until the summer.